Enter the 4th dimension with the Pro4 Service Course, Michelin's direct replacement to the popular Pro3 Race. This race-ready tire beautifully balances speed with durability, using a supple 110 TPI casing and a completely redesigned tread. Knowing not to mess with a good thing, Michelin shifted their redesign focus from materials to shaping. They pulled from their MotoGP division to create a new tread profile which delivers enhanced grip over the Pro3, despite this tire's similar makeup. At the end of the day, the redesign also resulted in a slight increase in wear resistance, allowing riders to get a few extra miles out of their rubber. The Pro4 Service Course is available in various 700c size (622 ISO) and colors. It features a folding bead and its actual weight is 205 grams (700c x 23mm). 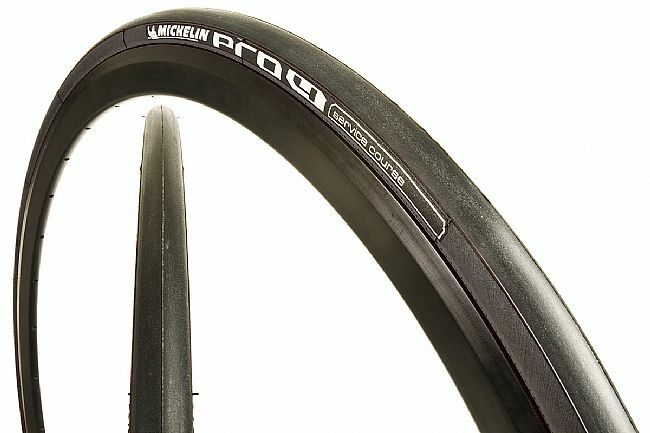 The rest of the Pro4 lineup includes the Pro4 Endurance, a direct replacement to the puncture resistant Krylion, as well as the Pro4 Service Course Comp and the Pro4 Service Course Comp Limited, both of which are race-specific event tires. Great tires...just a bit bigger than most 25s! I have been using Vredestein clinchers and Continental tubulars exclusively for years. For the last 6-7 years, for clinchers, its been 700x25 Vredesteins! I loved them but they seem to have changed their rubber compound. I ordered these pro 4s in 700x25. They definitely are bigger than the Vredesteins so much so that the rear tire was rubbing on the break arch at the top of the stay. The tires are great though! Once I took time to position my wheel as far back as humanly possible in the dropout, I got it to fit. Thy wear well, grip great dry or wet and feel almost like a tubular! On rougher western New York roads, they do make a bit of noise. I have about 650 miles on them so far and they dont have a mark in them! I have used these for years and they hold up really well - they provide a smooth ride. I have the blue ones which also look pretty cool! Good value for Michelin quality. Love these tires. I have been riding Michelin Pro Comps for many years and they continiously perform exceptionally well. They provide a smooth ride, great control through the corners and thave the protection of kevlar to resist punctures. Nice light tire with a grippie tread. However durability is an issue on rough roads with any gravel or rocks. The sidewalls just cant take it. The most I got out of two sets of these tires is 2250 KM. A great tire-used for many years! I love Michelin Service Course Pro 4s! Great handing, supple ride, and great flat resistance. I've used this series in many of its earlier versions with good results and this one is even better (I don't like the Comp version-be careful when ordering as labeling diff is subtle). I like that these mount up a bit wider than their stated size 23mm is a tad under 25mm. Following the trend of using wider rubber, I just tried the 25mm and love them-they measure in at 27mm mounted on Dura Ace rims. What a cushy and surprisingly fast ride. My concerns about width and weight of the larger size were put to bed with several PRs on my last ride. I have these on my daily commuter bike and they handle great in all weather conditions. Nice tires that hold up well. Good quality and price. Great tires, not really high mileage but great handling and fairly flat resistant if properly inflated. I am 250 pounds and inflate to 109 psi. They run a little wide, my 25s were actually 27s. Great product overall. Tires hold well in turns and little rolling resistance, never had any problems with them. I use these tires on my training wheels. They are my second set after wearing out the first with mileage. The tires are a great value, hold up well, and ride nicely, too. My only complaint would be that it seems that I have gotten more flats than with the previous tires I had (Schwalbe), but that might also just be coincidence. Tire tread started to separate on a recent ride. Maybe 1K miles total use. Local shop said 2nd they had seen recently. Nice tire. Rides well and would buy michelin again. Great tires for the price!! I am on my third set of these tires love them they are a good deal for the price usually get around five to six thousand miles out of them. I have only ever had one puncture in it was because the tire was bad in the first place.